If you or your child have food allergies, you understand how restricting eating can be. What I find liberating, however, is that there are so many great companies out there helping to fight the same battle. In our house, there are certain brands that we can consistently rely on to provide safe and delicious food for our family. We have just discovered a new brand to add to our list! 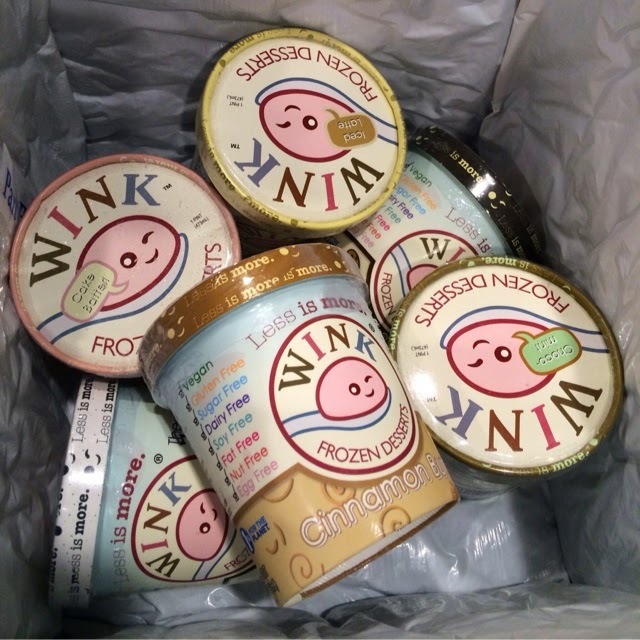 Wink Frozen Desserts makes an ice cream that is not only free of the top 8 allergens, but also contains only 100 calories per pint! Yes, you read that right. 100 calories per pint! No guilt in enjoying this delicious treat! I can give it to my kids on a regular basis with a clear conscience, and they think I'm the greatest mom in the whole world for giving them ice cream so often. Wink was recently created by a young man named Gabe. As a child, Gabe enjoyed ice cream as most kids do. At age 17 he was diagnosed with Celiac Disease and a milk allergy. As many of you know, ice cream can be hard to come by when you have a milk allergy. Gabe decided to use pea protein to create his favorite treat in a safe way. And the results are amazing! 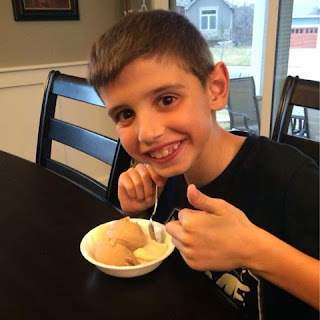 Gabe not only wanted his ice cream to be free of milk and gluten to meet his own needs, but also to keep out fat, sugar, and artificial ingredients to allow people with a variety of dietary restrictions to be able to enjoy it as well. Of course, as a Top 8 Free food, this ice cream is free of peanuts and tree nuts too! I would have to say his creation is a success. 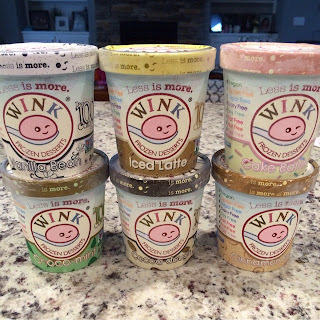 Wink offers 6 delightful flavors including Cake Batter, Choco-Mint, Cinnamon Bun, Cocoa-Dough, Iced Latte, and Vanilla Bean. Our family had the opportunity to try each flavor. It's so hard to pick a favorite! Personally, I love the Cake Batter. 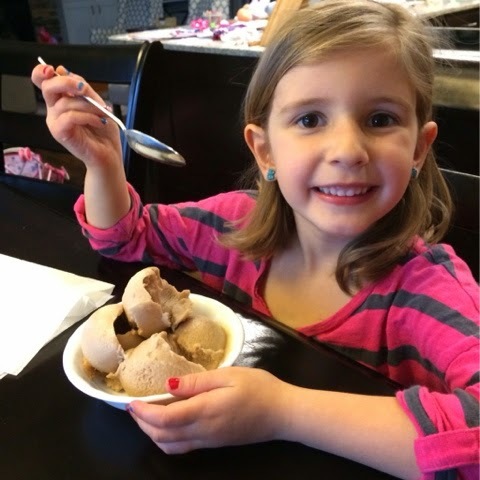 Two of my kids picked Choco-Mint as their favorite with Cocoa-Dough as a close second. The other two chose Vanilla Bean as their favorite, which is perfect by itself or topped with some fresh fruit. You could practically eat the Cinnamon Bun for breakfast! And the hubs enjoyed the Iced Latte (he's our resident coffee drinker). You just can't go wrong! I was expecting the see chunks of chocolate chips, cookie dough, etc in these pints, but it's all cream. That does not compromise the flavor though! The ice cream tasted like we were at Orange Leaf where we (those of us without food allergies) get flavored frozen yogurt! Amazing! 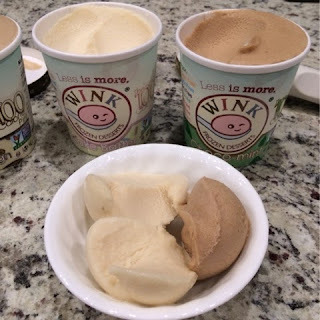 Since Wink Frozen Desserts don't have any fat content, it helps to stick the frozen pint in the microwave for a few (10-15) seconds to give it a creamy consistency. Boy, did that do the trick! 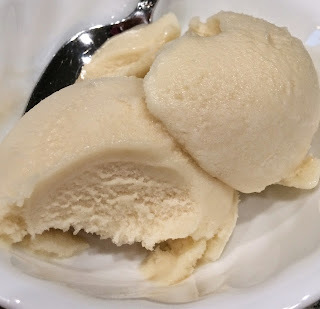 It was so easy to scoop and was nice and creamy! I mean, really, look at this picture! Since Wink is still a relatively new company, it is not yet widely available in stores. Luckily, you can order online, and your pints will be shipped directly to you in an insulated container with dry ice to keep your treats frozen. Or you can enter this giveaway for a chance to win one pint of each flavor! That's 6 pints shipped directly to your door! One lucky winner will be chosen on Friday, April 3. Click here for details! I like to keep certain foods on hand for impromptu outings. Going to Orange Leaf is one of our family's favorite treats in the summer. But Bubs and GirlyGirl always have to bring a treat from home since they are peanut and milk free (in addition to other allergies). 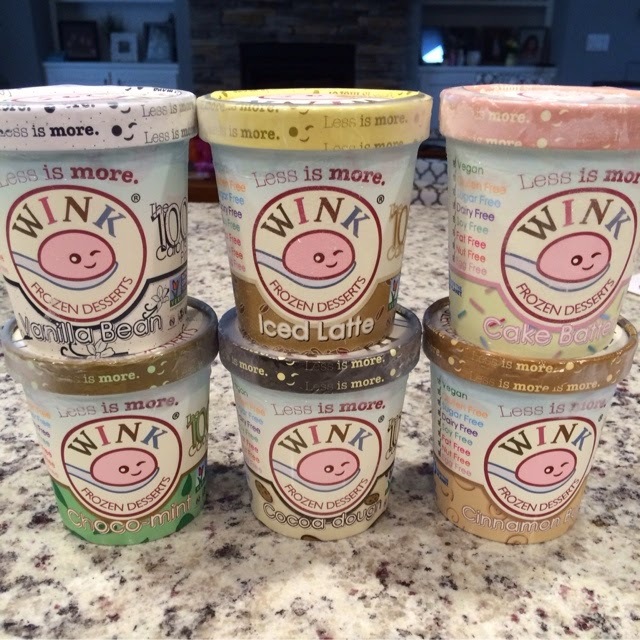 We will definitely be keeping pints of Wink in our freezer for the kids to bring with them one this kind of a trip. I hope you enjoy it as much as we do! Our lucky winner is......TED BRYANT! Congrats, Ted. And thanks to all who entered. I hope you get some Wink of your own!